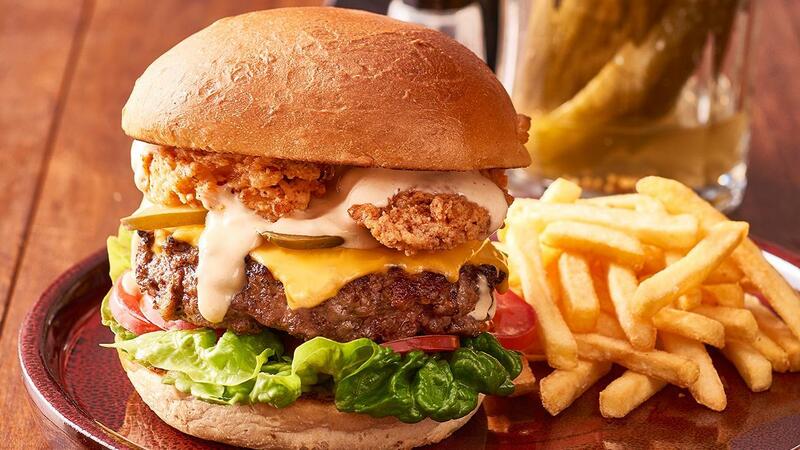 Burgers are on every pub and club menu throughout Australia and New Zealand, the difference here is the homemade patty using a good quality cut of meat and passing through the mincer just once to deliver a steak like flavour when cooked. Add American cheddar, deep fried bacon and Thousand Island dressing all on a grilled brioche bun, this will have your customers coming back for more. Season mince well and form into 10 patties using a mould. Grill burger until medium rare, placing cheese on top to melt for final minute. Place buttermilk in a bowl. In a separate bowl combine flour, KNORR Aromat and season with pepper. Coat a slice of bacon in flour mixture, then in buttermilk, then flour again. Deep fry until crispy. Combine HELLMANN'S Real Mayonnaise, white onion, tomato ketchup, sweet pickle, KNORR Garlic Puree and KNORR Mixed Chilli Puree. Grill the buns, then place the lettuce, tomato, meat patty, pickles, deep fried bacon and top with bun, serve with French fries. Ask your butcher or meat supplier to put the beef chuck through the mincer once for a courser mince. To save time you can substitute Thousand Island Dressing.